Donington Nurseries act as agents for a reputable family-owned shed manufacturer and we offer a choice of well-constructed Playhouses in a variety of sizes and styles. 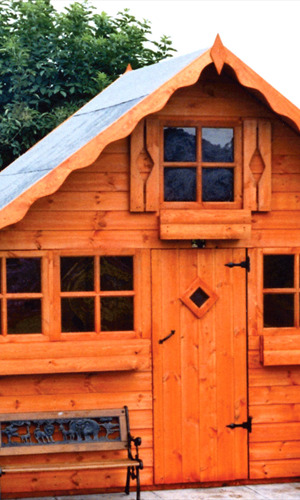 All Playhouses are made to Trading Standard regulations and are fitted with the CE mark. Safety features include stair cases complete with hand rail and treads, safety acrylic windows with non-toxic leaded strips, anti-plastic strip around door to prevent fingers getting injured, all framing planed and rounded to prevent splinters. Our prices include vat, treatment, delivery and assembly in the Derby, Nottingham, and Leicester area. Please telephone for the latest prices.